My husband doesn't like lamb. Can I make it with beef? Yes, you can make it with beef. I can't believe you made this - this is unbelievably awesome! Such a lovely job of it. I'm only super jealous that I didn't taste it for myself. Dastet dard nakoneh!! Azita, this sounds delicious... I love how you serve it too. I really enjoy your blog. The recipes, stories and the pictures. Very nice photographs!! What kind of camera is used in taking the photographs? And who takes them?? Thank you! All pictures are taken by me and I have been using Canon EOS Rebel T3i for a while. Thank you for posting this, Azita khanum. I love that movie too and so I enjoy the reference. My baba would make aabgusht in the poshtebaan sometimes to avoid having the smell in our home - it was a good tip and it was tasty having it slow cooked. Thank you so much Mahtab jan. Merci aziz! 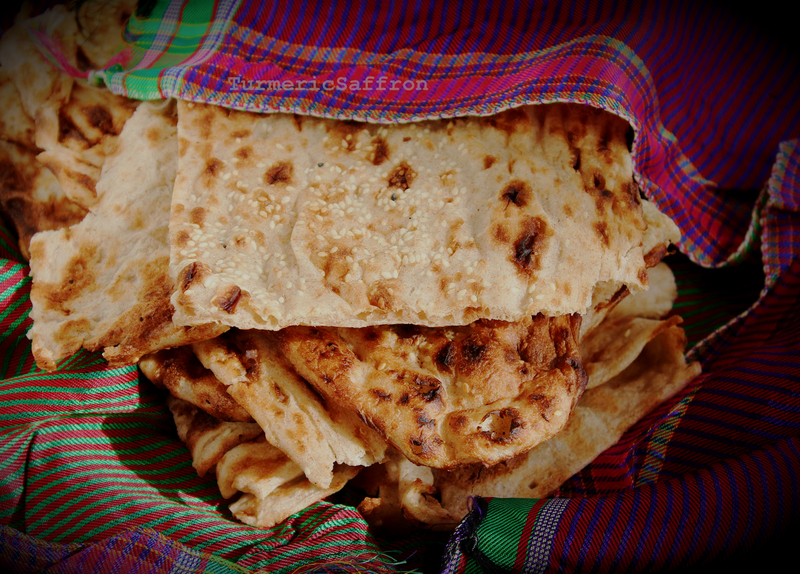 I was wondering if you had any recipes for whole wheat sangak bread?? 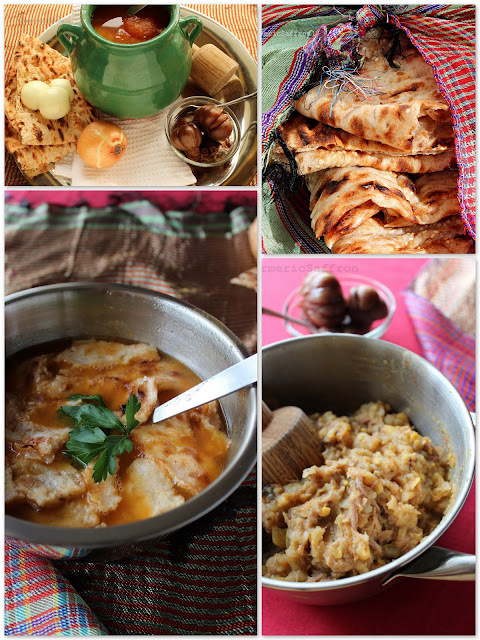 Awesome post in a very good blog...My mouth is already watering just from looking at the pictures and reading the recipe....can't wait to try this recipe... 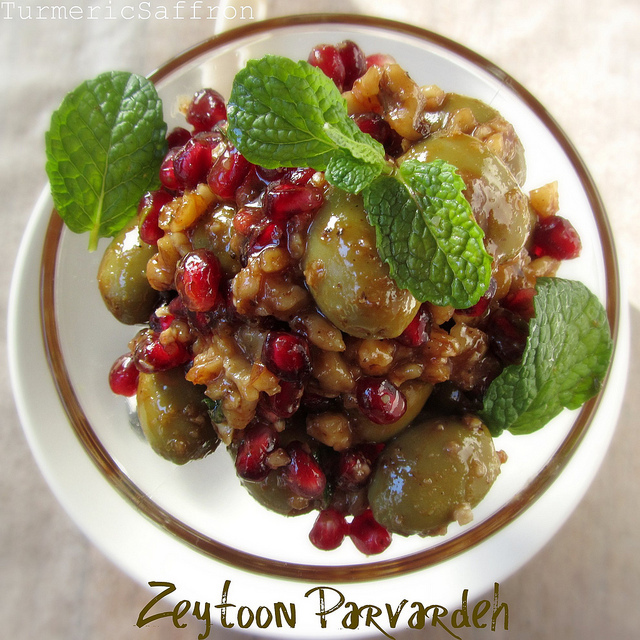 I think if never tried a Persian recipe and I think looking at this I definitely won't be disappointed. If you also have a delicious looking picture of a dish but the recipe is not in your language make sure that the translation is done by a professional translator to get the best result when you are cooking the dish. Looks wonderful! I'm a little confused about the pictures, maybe you can help explain? Is the picture of the red colored stew in the green crock and the white bowl, the stew before you separate the broth out? And then the pictures with the metal bowls, one with the broth with bread broken up in it, and then in the other metal bowl with the masher, the meat, beans & veggies mashed together? Do people sometimes eat it not separated, like in the last picture with the white bowl? Jen, these photos are of abgousht/dizi before and after being separated and served in different serving bowls. The traditional way is to separate them and mash the meat and potatoes. 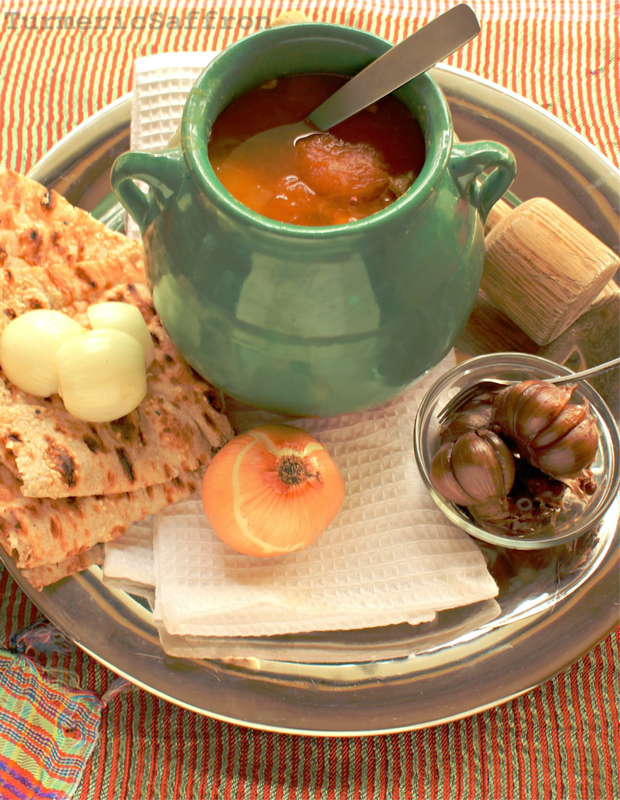 The soup is then served in a bowl (ceramic or metal)with pieces of bread mixed in or served on the side. 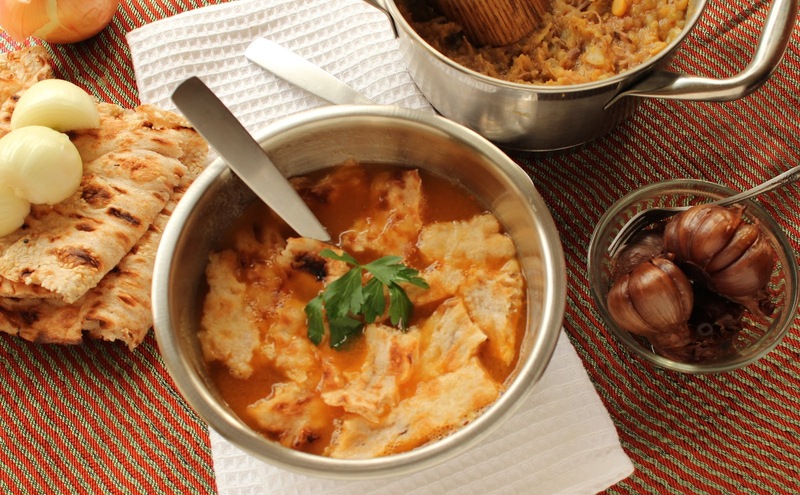 You can also serve it in a dizi (crock), as pictured above. What you see in the last picture is the soup that's not fully separated. I like to serve the soup part with some potatoes and tomatoes mixed in. Thank you, that makes sense to me now. :) Looks like a lovely meal, and I look forward to trying it! Thank you for taking the time to explain the Farsi words, too! I made this for my family last night, and my husband raved about how good it was! I have wanted to cook more Persian dishes for years, and your blog has finally gotten me doing it, with wonderful results. Your photos are so beautiful, they make me want to cook, and your instructions are so clear and easy to follow. Your blog brings me warm memories and many smiles. Thank you! I served the mash with yogurt mixed with mint, some yummy flat bread, and *pomegranate syrup* drizzled on top of the mash. Unconventional, maybe, but it was really tasty together! My hubby said it was the combination of everything together that made it so amazingly good to him. I showed my family your blog, and read to them what you had written about this dish. :) It's so nice to get to share things like this with them. Thank you again! Dear Jen, I am so glad you you and your family enjoyed this recipe! Thank you very much for visiting my blog and commenting. 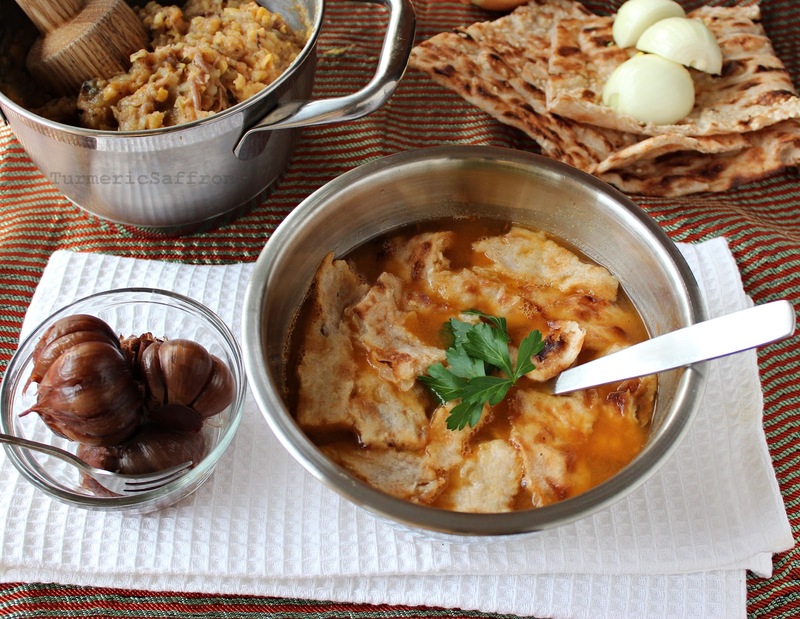 Abgoushd is one of my all time favorite dishes, especially in the winter. Looking at these pics make my mouth water. How long would it take in a crackpot and for how many hours. I have guests tomorrow and would love to make it. Ninely, It will probably take about 6-8 hours to cook. if you add the limo amani so early on in the cooking doesnt it make it bitter? Karen, keeping the dried limes whole (piercing them in a few places) until they are fully cooked doesn't make the stew bitter. 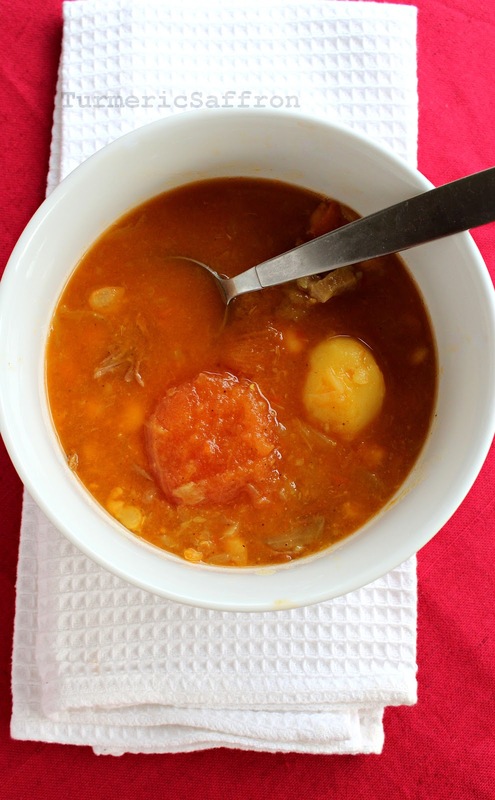 Limoo amani brings out the flavor in the lamb stew and makes it more tasty. Are the limoo amani to be mashed with the rest of the ingredients once the cooking is over, or must they be removed prior? I've never used this ingredient before, and am making this recipe for the first time. Yes, you can mash all the ingredients together. is this ab ghoosh? I've had it in a restaurant in Malaysia!